Korean Air is the national air carrier of South Korea and was a founding member of the international Skyteam airline alliance. Korean Air has earned a name as one of the top airlines for business travelers (voted “World's Best Airlines” by Business Traveler magazine in 2012) and its Business Class enjoys consistently positive reviews for its polite cabin crew, reclining seats and private mini-suites, and advanced entertainment systems. 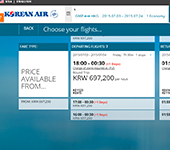 The Korean Air website is available in a number of languages (including English) and offers clear buttons in the header to search and book new flights, complete an online check in, see details of one's reservations, and check flight schedules and flight status. 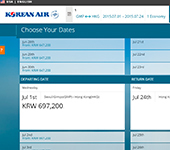 The website also offers details on Korean Air's baggage allowance policy which, while it does vary depending on the trajectory, usually allows 1-2 pieces of free checked baggage for economy travelers. 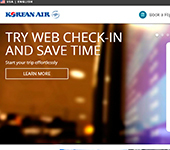 As a member of the SkyTeam alliance, Korean Air also participates in the famous SkyPass membership program. This program offers frequent flyers the ability to rack up miles on Korean Air flights which can be redeemed with Korean Air itself or for discounts with partners like Hertz and AVIS rental car companies as well as a number of tourist attractions and restaurants in South Korean. Where is Korean Air located?